Because it is constructed of durable melamine, you can expect this oval Cafe Blue melamine platter to be a part of your servingware collection for years to come! 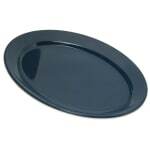 Great for appetizers, salads, and snacks this Carlisle Dallas Ware oval Cafe Blue melamine platter measures 12"x 8-1/2". Perfect for any buffet or sit down restaurant, this Cafe Blue melamine platter cleans to a beautiful shine every time and will resist cracking and pitting. The oval shape of this Dallas Ware melamine platter makes it easily stacked and stored.